This Gala event is a celebration of 13 valley bands and our music community at large, we will releasing our new magazine and our first CD, Local Honey! 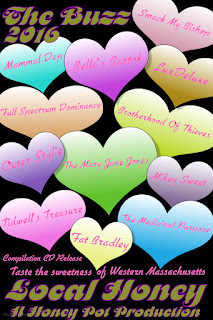 Full Spectrum Dominance, LuxDeluxe, Mammal Dap, Mikey Sweet, Outer Stylie, Smack My Bishop, The Mary Jane Jones, The Medicinal Purpose, and Tidwell’s Treasure. In attending this Gala Cd Release of Local Honey you are supporting and celebrating musicians that make the Western Massachusetts music community so vibrant, economically and artistically. The purpose of the compilation is to assist in exposing these emerging talents coming out of the 413 area. Each band of the 12 on the compilation will be given 50 copies of the Cd to ad to their merchandise, that’s 600 Cds for the bands to sell! All monies obtained in the sale of the Cds they sell are for the bands to keep. In the sale of Local Honey to each of their fan bases they expose their audience to their fellow local contemporaries talent and our thriving music scene. 250 copies of Local Honey will be given to Gala attendees, price included in Gala ticket cost. The remainder of the 150 will be for sale online and used to promote Local Honey artists. · 9 performances from Bella's Bartok, Eavesdrop, LuxDeluxe, Mammal Dap, Mikey Sweet, Smack My Bishop, The Mary Jane Jones, The Medicinal Purpose, and Tidwell's Treasure. · Presentations and speeches from keynote speakers from our music community. You can register a group of any size, tables seat 8. All dining details are at this site. This is a formal event so please dress accordingly. Please call 413 387 5795 with any questions. This is an exclusive event, limited to 100 tickets. Ticket Sales end on Thursday February 11th.